When you are a first-time parent, it is natural to have questions about your child’s dental health. Relying on a knowledgeable pediatric dentist is the best way to get the helpful tips and information you need to ensure that your child’s smile is healthy and bright. At Alligator Dental, we are proud to be a Top Rated Local® dentist in San Marcos, and if you have questions about caring for your child’s teeth, then we would love to answer them. Give us a call at 512-393-3500 today to speak with a friendly member of our staff or make an appointment online now! We know that life can be hectic, and sometimes you might just want a quick online reference for information. Today, we will review seven common pediatric dentistry questions that we often hear from parents. Read on to learn more! This is probably the most common question that our team hears. In accordance with the American Academy of Pediatric Dentistry (AAPD) guidelines, we recommend that you bring your child in for a visit once the first tooth appears, usually no later than his or her first birthday. Establishing a relationship with a trusted children’s dentist early on will help your child feel comfortable going to the dentist, an important building block to developing good oral hygiene practices. Many people mistakenly believe that family dentists and pediatric dentists are one in the same. While both can provide dental care to children, a pediatric dentist receives specialized training which exceeds that of a family dentist. In fact, kids’ dentists undergo two to three years of additional schooling beyond regular dental school. Pediatric dentists limit the scope of their practice to providing dental care for infants, children, and teens only. How Important are My Child’s Baby Teeth? Even though they will eventually fall out, it is essential to take care of baby teeth just as you would adult teeth. There are several reasons why baby teeth are so important. First, your child’s first set of teeth are critical for speaking clearly and chewing food correctly for proper nutrition and development. 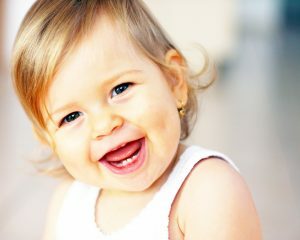 Additionally, baby teeth pave the way for your child’s permanent teeth, guiding them into the right places while developing the jaw bones and muscles. Because baby teeth are so important, you want to help your child take good care of them. You can clean your child’s gums with a soft cloth and water before his or her first tooth arrives. Once the first tooth erupts, you can begin brushing two times a day with a small amount of fluoride toothpaste. Between the ages of three and six, you can increase the amount of toothpaste to about a pea-sized dollop and begin to teach your child to brush his or her teeth independently. Dental sealants are approved and recommended by the AAPD as an effective way to prevent cavities in children. They are applied to the chewing surfaces of children’s teeth and fill in the cracks and crevices to form a hard protective layer. This keeps food particles from getting lodged in the grooves of the tooth, preventing decay and cavities. Dental sealants are quick and easy to apply, and they are particularly effective for children who have a hard time brushing their back teeth, or for those who are susceptible to tooth decay. In a previous post, we reviewed a few common pediatric dental emergencies, including everything from toothaches and broken teeth to knocked out teeth and dental intrusions. These types of oral injuries happen to many children and can be caused by any kind of impact to your child’s mouth. If your child is complaining about pain or sensitivity in his or her mouth that does not subside after rinsing with warm water and applying a cold compress, it is best to call your local pediatric dentist as soon as possible. 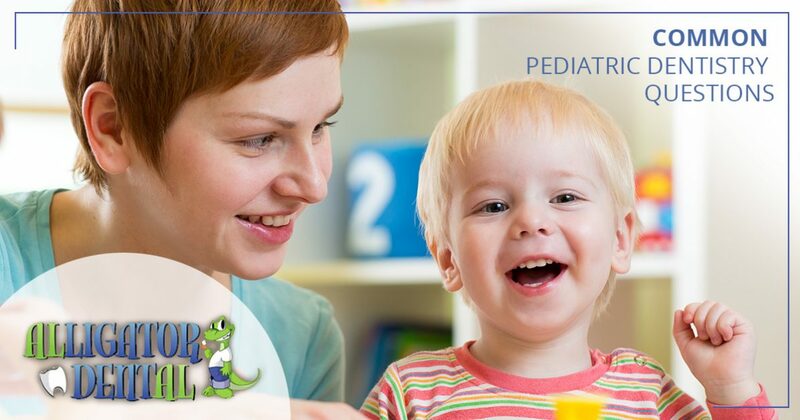 At Alligator Dental, we gladly provide after-hours pediatric dental care and we have “early bird” hours to accommodate emergency appointments between the hours of 7:30 am and 10:00 am on regular operating days. Many parents are concerned about the amount of radiation their child is exposed to during routine dental x-rays. This is a completely valid concern. However, you can rest assured that there is very little risk in your child having radiographs taken during his or her appointment. X-rays will only be taken as needed (usually once a year) in order to provide the dentist with a full picture of your child’s dental health. While there is a small amount of radiation with any type of radiograph, high-speed film and lead aprons reduce your child’s exposure as much as possible. Do you have additional questions about your child’s dental health that you don’t see listed here, or are you looking for a fun pediatric dentist in San Marcos? At Alligator Dental, we make going to the dentist fun for children! Our experienced team specializes in providing everything from routine dental care to emergency and restorative care to children in your area, and we would love to meet you and your child. Call us today or feel free to swing by our office for a tour. We are conveniently located at 1890 Medical Parkway in San Marcos and we are open Monday through Friday from 8:00 am to 5:00 pm. See you soon!